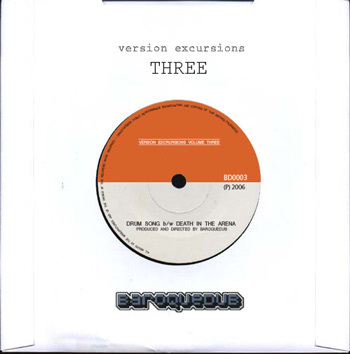 Things are getting stripped bare and going digital for this the third release in the Versions Excursions digital 7inches series. Two more classic riddims get the treatment, this time with a nod to the retro-electro scene which has been re-claiming the 80's as period not entirely devoid of musical brilliance. Treading the fine line between cold and sparse digital rhythms and truly emotive musical composition isn't an easy thing to pull off. These two instrumental reworkings are defintely intended to put a smile on your face. What's the point of ultra-chic posturing if you can't also have fun with it? Let's see what the New-Rasta-Romantics make of this one. Credited to Jackie Mitto, this classic riddim has been the back-bone of many a conscious roots song. Here it's deconstructed into an instrumental with a hint of Air's laid-back spaced-out lounge sound. A clean arpeggio undercuts the loping groove, taking the whole head-nod riddim into kraftwerk territory... Welcome to the world of electro-reggae. A Jonny Clarke / Soul Vendors classic, this version first strips the riddim to its bare essentials before a slinky analogue melody and anthemic FM bells ring in the changes - there's a new champion in the arena.